Hearing Su Yi’s words, Yiyun instantly cried out with her high pitched voice. But her body was quite honest as took out her interspatial bag. “Look at the two of you, fine young ladies as beautiful as flowers and as exquisite as jade. If you were to end up in the hands of those brutes, I think you would know what is truly called lowly and shameless.” Su Yi pouted. He had done absolutely nothing to them, yet how did he suddenly become a lowly and shameless person? Bi Ling gritted her teeth and tossed her interspatial bag to Su Yi. She did not believe what Su Yi had said. Those adventurers are most definitely not on the same side as Su Yi. Instead, it should be the opposite. Those adventurers bore a huge grudge against Su Yi and both sides were used by him. Yiyun did not think twice and immediately tossed her interspatial bag towards Su Yi as well she seemed to have become afraid, that Su Yi would really hand her over to those brute adventurers. Catching the two interspatial bags, Su Yi smiled pleased and kept them with him, without a single hint of unease. 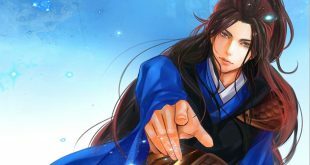 He then picked up the three treasure swords of Guoyan and the others from the ground. Based on the appearance of these three swords, he could already tell that they were not bad and would fetch a hefty price. Su Yi did not intend on letting them pass. With their eyes wide open, Guoyan, Zhouda, and Qingfeng were seething with anger as they witnessed the daylight robbery. But what could they do? They were already injured to the point, where they could not fight anymore. It was a struggle for them to even get up. Su Yi carried his saber, singing a song. He looked like he was on cloud nine, he then waved his hand and left, leaving only a striking scene of his back for the five people to see. Bi Ling mumbled to herself. That youth was unlike any other she has ever seen. Abruptly, Yiyun snapped out of her daze. She looked at Bi Ling, her eyes showing how stunned and dumbfounded she was. Su Yi was merrily singing a song. He was in a great mood after all he had reaped quite the harvest. There should be a lot of good stuff within the five interspatial bags, but he was in no rush to open them. Su Yi did not let his guard down. He kept on analyzing things in his mind. With the cultivation levels of those five youths, the first batch of adventurers shouldn’t be able to harm them to such an extent, so they must have fought with the second group of adventurers. After all, the Yuan Xuan Realm Second Grade cultivator, who he had just killed, did fire off a signal flare. As expected, when it was dusk, Su Yi met the search party from the adventurer group. The four adventurers were stunned for a moment when they saw Su Yi, but they were delighted right after and wanted to fire off a signal flare. But just as the adventurer wanted to fire the signal flare, they heard a loud screech coming from the sky. A swift and horrifying wind passed by sending sand and rocks flying before the person could figure out what was going on, his head became a bloody pulp. Out of nowhere, a huge white ape appeared. Then its giant palm slammed down and turned the guy into a bloodied pancake. Two gigantic beasts had appeared and their auras were ferocious and terrifying. The remaining two surviving adventurers trembled in fear, they were weak in their knees and their eyes were in a daze. Both of them nearly collapsed onto the ground due to fear. Then a figure like lightning, leaving behind only a trail of afterimages appeared. A flash of light came from a saber and blood spurted out from the two men’s necks; their bodies fell onto the floor lifeless. The four adventurers were experienced and stayed in the Forest of Demons all year round, but they could not respond to this sudden event as they were scared soulless by the two savage beasts who had appeared so suddenly. They were killed without knowing how they died. From the depths of the forest, three corpses laid. Blood flowed down Su Yi’s saber, cold glint laced with bloodlust shone in his eyes. The night was starry, but the moon was dull. Under the faint moonlight, the entire mountain range was cold and creepy. From the mountains, numerous sounds of explosions could be heard. Several bodies left strewn across the ground. Pools of blood formed on the ground and the eyes of the corpses bulged terrified. The last thing they saw in this world was the face of the bloodthirsty youth. The third day, the darkness before the dawn had just passed and the first light of the day had not completely risen. The thunderous roars of beasts were resonating through the entire valley. The sounds of explosions rang and the ground shook. There were numerous corpses lying all across the ground. Fresh blood painted the entire valley red and the smell of blood and fear lingered in the air. Within the mysterious space, Su Yi was sitting down and meditating. The dense energies of heaven and earth flowed around his surroundings and strands of energy slithered into Su Yi like snakes. Within these three days, Su Yi had taken the initiative and had killed several search parties belonging to the adventurer group. The number of bodies that had fallen at his hands was no less than 30. There were also Yuan Xuan Realm Sixth Grade and Seventh Grade cultivators that had been killed by the Flaming Beast Eagle and the Snow Jade Ape. With the baptism of blood and killing, Su Yi had once again improved in combat. He was becoming more and more skilled in using the Three Sabers of the Raging Dragon, Seven Injuries Fist, Crimson Flame Palm and other techniques. But Su Yi still could not manage to use the Third Saber of the “Three Sabers of the Raging Dragon”. With the constant exposure to blood and killing, the “Supreme Chaotic Yuan Technique” surged and boiled within Su Yi. Endless fighting spirit burned inside him as the more he killed, the more he wanted to fight. After every baptism of blood, Su Yi meditated and recovered. He could clearly feel how much he had improved and how the “Supreme Chaotic Yuan Technique” was becoming more and more alive within him. Together with this mysterious space, he had improved by leaps and bounds. It was as if the “Supreme Chaotic Yuan Technique” naturally influenced him to fight and kill. Such news traveled far and wide like a spreading wildfire.